Escape Santiago för att njuta av Andes naturliga storhet under denna 8-timmarsutflykt till Cajón del Maipo med en liten grupp. Njut av utsikt över gushing vattenfall, isiga glaciärer och höga klippor som du besöker denna natursköna utomhusområde. Häll det hela genom att njuta av en inkluderad picknick med rött vin och ett mellanmål med lokala ingredienser. Ta emot en morgonhämtning från ditt hotell i Santiago. Du kommer att resa med luftkonditionerade minivan ut ur staden mot Cajón del Maipo i den bergiga Andesregionen utanför staden. När du kör, gör du periodiska stopp för att ta utsikt över lokala vattenfall och glaciärer. Du kommer snart fram bland de höga bergmurarna i detta natursköna bergsområde, och tar dig tid att njuta av vykortets perfekta vyer när din förarhandbok förbereder din medföljande picknick. Sippa på chilensk vin och ett mellanmål med lokala ingredienser, en måltid gjord ännu bättre av din otroliga utsikt. Efter att ha avslutat din picknick och utforskning av området, klättra in i din van för resan tillbaka till Santiago, där du kommer att släppas på ditt hotell runt 17:00. I enjoyed seeing the sights, the crew were professional and informative. We had enough time at each place. I would have liked to walk more and enjoy being a bit more active, this is just my personal preference. The picnic was a good variety and a nice touch, nice wine and pisco sous and the fresh empanada was delicious. Nota 1000 para o guia Gabriel e para seu pai motorista do passeio. Tive alguns contratempos com a agência, mas que foram sanados pelo profissionalismo de Gabriel. O passeio vale cada dólar gasto. 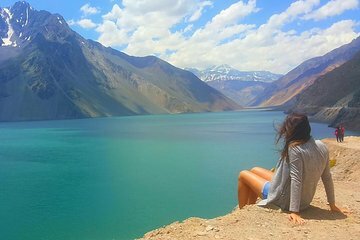 Muito lindo Cajon del Maipo. Picked us up right on time at the door of our Air BnB, the guide was very personable and knowledgeable about the area and country. The trip was fun, educational and stress free. I would highly recommend this trip to anyone visiting the area. O lugar é maravilhoso, com uma paisagem de "tirar o fôlego" ! O guia Francisco foi super atencioso e dedicado; preocupa-se com cada detalhe, a fim de tornar o passeio inesquecível. O motorista Patrício também foi muito dedicado e competente. E para completar o passeio, um delicioso picnic. Não poderia ser melhor! The BEST tour during our vacation in Santiago de Chile! Hector our tour guide and Gabriel our driver were EXCELLENT! They had the inside track on all the places to go and what time to arrive to avoid the crowds and make it a unique experience. We arrived at the base of the Andes mountains to see the mirror image of the Andes reflected on the water truly a magical experience. Nature as it's BEST. It was a beautiful day the sky was the most beautiful shade of blue with fluffy white clouds against the Andes mountains backdrop breathtaking. While we were taking selfies and 1,000 pictures Hector and Gabriel set up a table for the picnic which included wine! 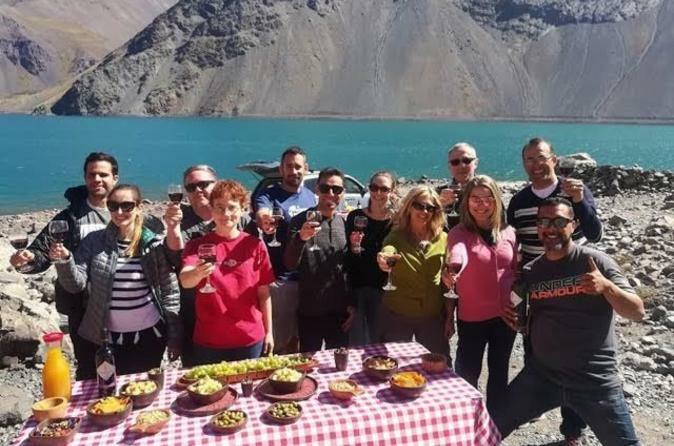 We then travel to see a waterfall and raging river followed by a pit stop to have cheese empanadas with a view of the Andes. Highly recommend this day trip if you are going to Chile! Our guide, Hector, and our driver, Rodrigo, were fabulous guys to spend the day with. This is a long drive out of the City through small Chilean towns to the beautiful reservoir that supplies the water to Santiago. The location is stunning, set at the base of the Andes mountains. Hector shared very interesting historic and current information. We stopped at a classic Chilean farm for empanadas on the drive home. The other fabulous guests along with Hector and Rodrigo made it a perfect day. This was a fantastic tour experience of a must-see landmark in Chile. Our tour guides, Gabriel and Hector, delivered a high quality experience that was educational, convenient and fun! Based on our observations in the area, this tour seems like the best bang for your buck, between direct drop-off at the sites (no walking required) and a delicious spread of cheeses, wine and savory snacks once in the valley. Overall would highly recommend this tour! Our guide, Francisco took my daughter, my grandson, and me along with two others on a one-day trip on September 30, 2018 into the Andes from Santiago, Chile. Francisco was excellent in every way: giving us information along the way as well as being an excellent driver on roads and in weather (it snowed) that was challenging. We made several stops at high altitudes that were interesting and provided astonishing views. On the way we stopped to rent heavy clothing, and the price was reasonable. More importantly, the extra clothing (especially the boots) were really necessary to get around once we passed the snow line. This was an excellent trip.